If you have any bottles of nail polish that you would like to part with, then the Zoya exchange program is for you. You can get rid of your old polishes and get brand new bottles of polish from Zoya. Check out the details here. You can select any color you wish from the Zoya line!!! Is anyone out there going to see the new Madea movie? Have you seen this character? More giveaways will appear on this site, and I will get back to my regular videos, but until then......... Have you seen this little fellow in Target or other stores? Dude Da Bunny is a hollow chocolate bunny complete with gold chain, sleepy eyes, knit cap, and sweater. One hand is in a pocket, while the fingers on the other hand form some sort of sign. I decided to look this bunny up online and I didn't turn up much information except that the company also makes Diva bunny, a little bunny who is adorned with, as the box states, BLING BLING! Sigh, your thoughts? 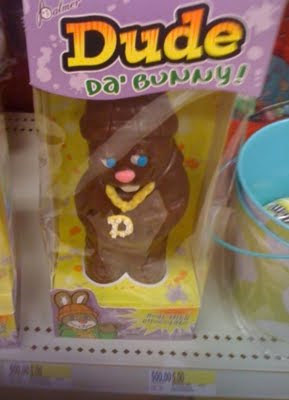 Is Dude DA bunny too much or it is just a cute chocolate item? Thank you all for participating in the Shabby Apple Giveaway!! The winner is Sarah, comment #9. Please send me your mailing address and the size of your dress. You can email your information to this address product_junkie_queen@yahoo.com. If I do not hear from you within three days, I will have to give the prize away to another randomly selected person. For everyone else, you can still get 10% off your purchase by using the code mentioned in this post. Have you ever heard of Shabby Apple? If not, consider this your introduction to the online vintage inspired boutique. Their wide selection ranges from clothing for women as well as little girl's dresses and even athletic garments. The Shabby Apple offers clothing styles that can be worn to work as well as a night out on the town. The dress pictured above is priced at $86.00. One randomly selected winner will receive this lovely dress. Each dress on the site has it's own name and this one has been named "Spanish Steps". If you click on the "Spanish Steps" link, you can take a look at different views of this dress and you can zoom in for a closer look. Simply leave a comment below and the winner will be selected on Monday. This dress is described as having a generous fit. Sizes for this dress range from XXS- XL. Please note that I have not made any purchases from the Shabby Apple, but they were generous enough to offer one dress for this giveaway.